"This is a delicious vegan Indian recipe where vegetables and chickpeas are served over small potato cakes. It works well as a starter for four, or as a vegetarian and vegan main for two. Place the potato cakes on a plate, serve the chickpeas on top, and don't forget the sauces! Recipes for Indian sauces - coriander sauce and tamarind sauce - are on this site. Finally, sprinkle with some fresh coriander leaves and a few thin slices of fresh onion." Place potatoes into a large pot and cover with salted water; bring to a boil. Reduce heat to medium-low and simmer until tender, about 20 minutes. Drain and peel. Place cooked potatoes into a bowl and add cornstarch, ginger, cumin, cayenne, cilantro, salt, and pepper. Mash together with a fork. Oil your hands with a little vegetable oil and divide the potato mixture into 4 equal portions. Pat each portion into a potato patty about 1/3-inch thick. Heat 1 tablespoon vegetable oil in a skillet over medium heat. Fry potato cakes until golden, about 3 minutes on each side. Remove from heat and keep warm. Grind peppercorns and cloves with a mortar and pestle. Heat the remaining 2 tablespoons vegetable oil in a skillet over medium-high heat. Stir in red chile peppers, cumin, bay leaves. Add onion, ginger, and garlic. Cook and stir until onion is golden, about 5 minutes. Add pepper-clove mixture, curry powder, and turmeric. Mix tomato paste with water. Stir diluted tomato paste and tomato into the skillet. Cook over medium heat until the tomato has softened, about 5 minutes. Stir in chickpeas and simmer over low heat for 10 minutes. Spoon chickpea sauce over the potato cakes and sprinkle with cilantro leaves. 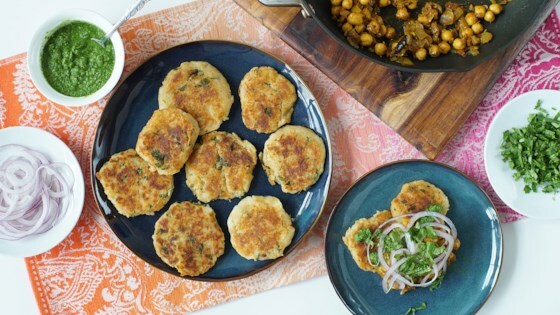 Crispy potato cakes topped with chickpea curry make an Indian vegetarian feast! A really yummy vegetarian dish! I'm going to use leftover baked potatoes next time. Delicious. No changes to this recipe necessary. Very good. Loved it! So flavorful. Pretty easy once you get out all the ingredients. Even with 3/4 tsp cayenne, it was pretty spicy! Will definitely make again. Kind of hot! Don’t think I will make it again!